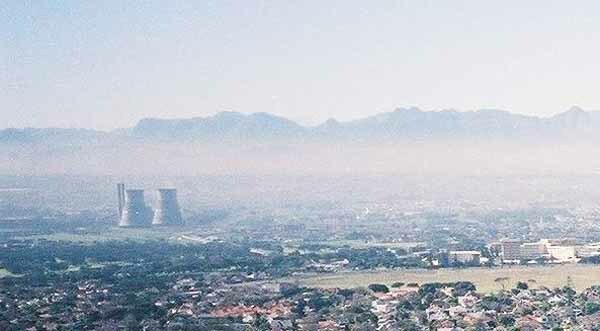 A view of Pinelands taken from Rhodes Memorial. Way back in Victorian times the Cape Colonial government laid out plantations of pine trees on the Cape Flats a couple of kilometres from Cape Town. The farm on which the pines were planted was called Uitvlugt and extended for several thousand acres over the then desolate Cape Flats. The Cape Flats is a flat sandy plain which is buffeted by the south easter in the summer months and would have been a very dusty area in Victorian times. Unfortunately for the government the plantation was not very successful so in 1948 some Cape Town businessmen approached the government for land to build houses on. Prior to 1948 in the UK a movement called Garden Cities was established. The aim of Garden Cities was to change the way people lived. In those days a landowner would build as many houses or flats as he could on a piece of land, have the narrowest of streets and would house as many people as possible in a small area. This lead to slum areas developing. The Garden Cities concept however was exactly the opposite. They wanted to build wide roads, give each houseowner a large house with a number of bedrooms and enough space around the house to have a garden and to not live on top of each other as they had in the past. The Garden Cities concept was introduced to the local government when they applied for land to build houses. As the pine forests had not proved successful the businessmen requested the government to grant them the land that the pine forests were planted on. Their application was succesful and the town of Pinelands came into being. The Garden Cities Trust was established and the land transferred to them to enable them to draw up the plans for the new township and to oversee the building of the houses they had planned. A number of different styles were built and had either two or three or four bedrooms. Once the township had been established the area was divided into plots . The roads between the plots followed the contours of the land and so were not straight as you would find in the normal towns built elsewhere. The township grew rapidly as men returning from the war saw an opportunity to purchase a house in the countryside with wide roads and space. With the help of the government of the day they obtained housing loans and where there were shortfalls Garden Cities assisted in granting second bonds to approved buyers. When the houses were built they were built in such a way that they always had a good view. Table Mountain to the west of the township was a favourite and many houses faced it. Where there was not such a good view the houses faced a clump of pine trees or something else so that there was always something for the home owner to admire when he looked out. The first houses were built in the south west of the township and many of these houses had thatched roofs. Uitvlugt was first area to be populated and here you will find many of the houses that were built in the 1930's still there today with their thatched roofs. As I mentioned earlier the roads followed the contour of the land and this of course led to many interesting roads. When you drive through the side streets of Pinelands you are bound to get lost as they have no direction. They go off at tangents, go round in circles and have corners where they should not have. In some instances a number of roads meet at the same point. The main road through the town today is Forest Drive and you will notice the many clumps of pine trees that still grow on the parks and sidewalks of the town. Part of the original Garden City's plan was to keep the streets safe for children so you will notice that the residential areas and the business areas have been separated. Howard Centre the main shopping area in the town although a number of other shops and offices have been built along Forest Drive over the years. 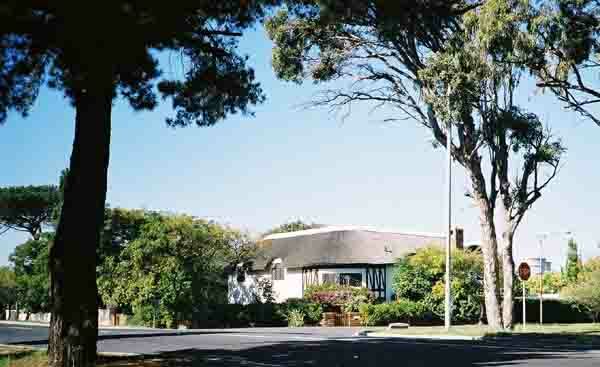 Pinelands today is old by modern standards and the houses are large and comfortable. Gardens are well established and if you look down on Pinelands from Table montain you will notice that the area is one of the most leafy in Cape Town. It is like a green oasis amongst the other built up areas you will find on the Cape Flats today. Pinelands is a lovely place to live and many families will do their utmost to purchase a house in the area. Unfortunately most of the land has been utilised and only houses which come up for sale are available to people wanting to move into the area. Garden Cities however has not sat still and have moved into other areas to build houses. The concept is normally the same. The roads run round in circles and have dead ends, large islands where kids can play and plenty of trees, parks and sportsfields. Next time you visit Cape Town take a drive through Pinelands, Edgemead and the newest township of Parklands to see how the concept works. You might even want to move in!